Windows Mixed Reality is designed to work best with mixed reality motion controllers. Motion controllers are hardware accessories that offer precise and responsive tracking of movement in your field of view using the sensors in the immersive headset, meaning there is no need to install hardware on the walls in your space. 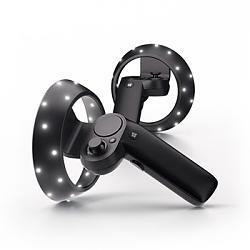 These motion controllers will offer the same ease of setup and portability as Windows Mixed Reality immersive headsets. For Windows Mixed Reality immersive headsets, motion controllers are the primary way that users will take action in their world. Motion controllers use Bluetooth 4.0 to connect to your PC. If your PC doesn’t have Bluetooth 4.0 , you can buy a USB 4.0 Bluetooth micro adapter and plug that into the PC. This tutorial will show you how to setup and pair your motion controllers for Windows Mixed Reality on your Windows 10 PC. If another set of motion controllers is paired with your PC, you'll need to unpair those controllers before pairing new ones. If you paired a set of motion controllers with your current PC and then paired them with a second PC, you'll need to unpair and re-pair them with the current PC before using them again. 1. Open Settings, and click/tap the Devices icon. If the controllers are turned off after pairing, their status will show up as Paired. If controllers stay permanently under “Other devices” category pairing may have been only partially completed and need to be performed again to get controller functional. 12. Repeat steps 3 - 11 for the second motion controller. All times are GMT -5. The time now is 23:54.